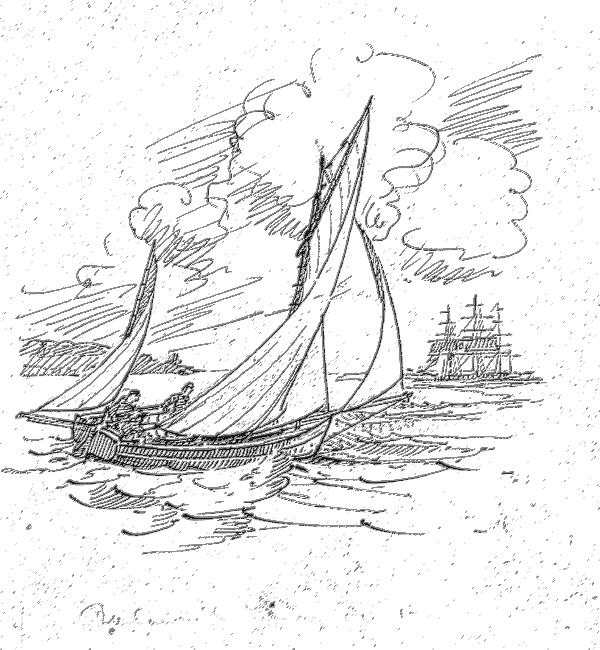 Show – an elderly motor cruiser and a Wharram catamaran. Earlier today I found myself reflecting that quite a few of the people who contribute to intheboatshed.net are likely to be at the Beale Park Thames Boat Show this weekend. Naturally we’re planning to be there on Saturday and looking forward to meeting as many of them as possible. I’d encourage any reader who can get there to make the trip as well. 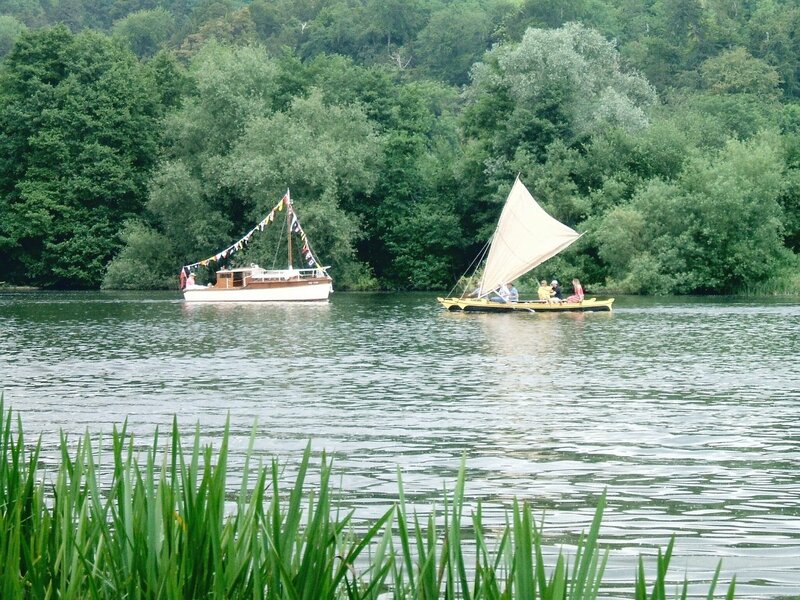 For boat building and boat restoration enthusiasts, part of the success of Beale Park is that it’s a show that works on many levels. Those who admire exquisite craftsmanship will find it, while those who need to be encouraged to build their first simple plywood boat will find that as well. 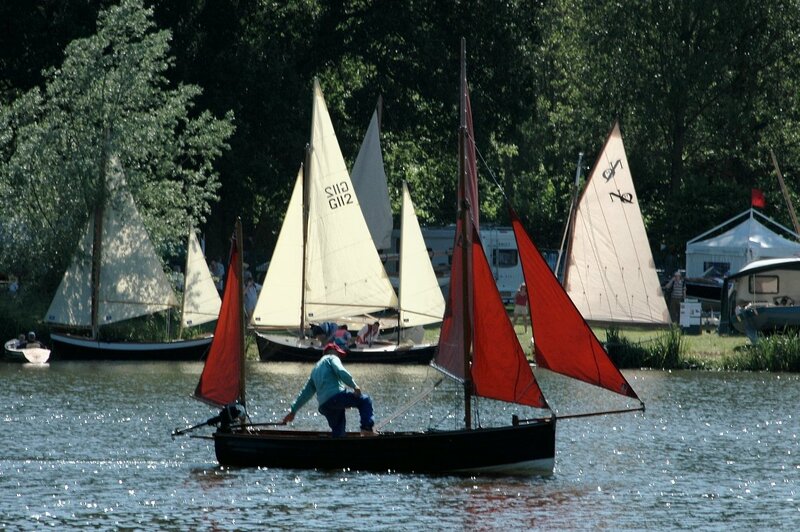 There are also stalls selling recycled bits of boats and old books, cut-price chandlery, smart bronze bits and pieces, top-quality hardwoods and plywood, sophisticated glues and resins. And then there are the sociable membership organisations. The Eventide Owners, the Dinghy Cruising Association and the rest, are all there to talk with show visitors, and they’re easily interesting enough to make for an interesting conversation. But on second thoughts perhaps I won’t be able to stand and talk for too long – after all, I’ll be making sure my camera is full of photographs to keep this weblog going through the winter months! The Cutty Sark Conservation people kindly sent me this update a few days ago. 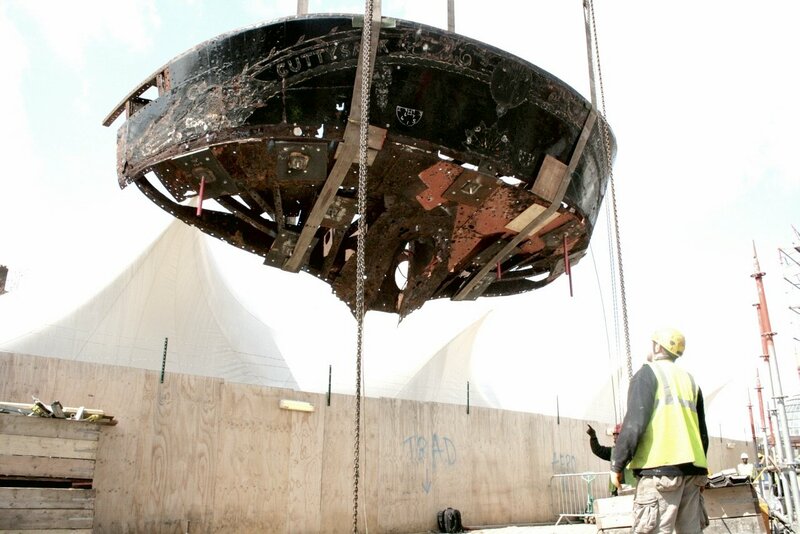 As you’ll see, it slightly predates the successful lift of the stern section pictured above. Like most people who have lived in London, I’ve very fond of the Cutty Sark, and I find the news very heartening! There will be a major step forward in the Cutty Sark Conservation project tomorrow when the counter, a large part of the stern, located at the back of the ship, is removed for electrolysis and repair. The removal of this delicate and large wrought iron structure counter was part of the original conservation plan which was in place before the fire broke out last May and its removal marks a major step forward in the project which aims to be completed by Spring 2010. The Cutty Sark Conservation project is firmly back on track following a generous £10m grant from Heritage Lottery Fund received in January this year. We’ve also received these splendid photos and an update from Will Stirling of Revenue Cutters & Smuggling Luggers. I’m sure many readers will remember his knockout 18th-century inspired design and build project Alert last year (see previous posts) and will be interested to know what he’s been up to in the first half of 2008. In fact, he seems to have a tremendous lot of work going on! ‘I’m spending a lot of time banging in nails! 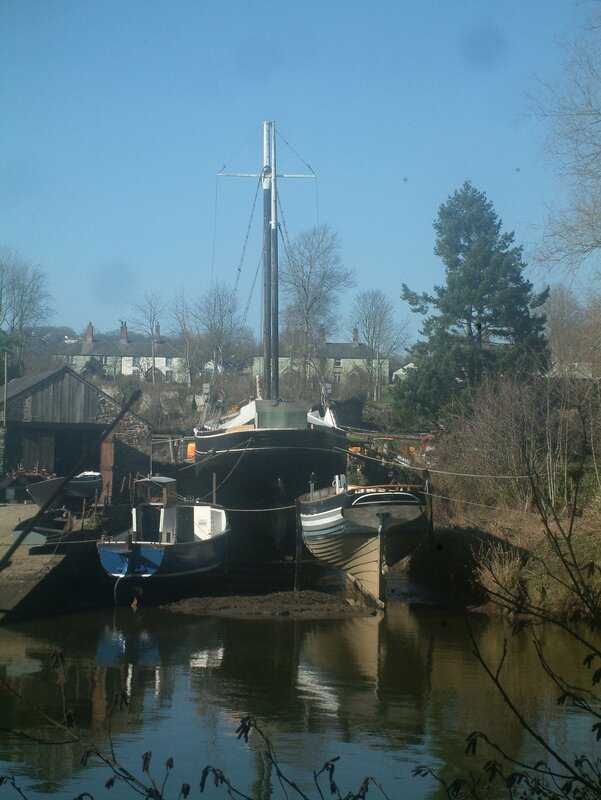 ‘We have a 150 ton West Country trading ketch Garlandstone on the slipway and are beginning a programme of further restoration after she suffered a period of neglect. ‘The upper works of a 40’ Admiralty pinnace built in Scapa Flow, Orkney during World War II are in the process of being entirely replaced. This has included redefining her sheer as it had been pushed out of shape after many years landing on the beach. 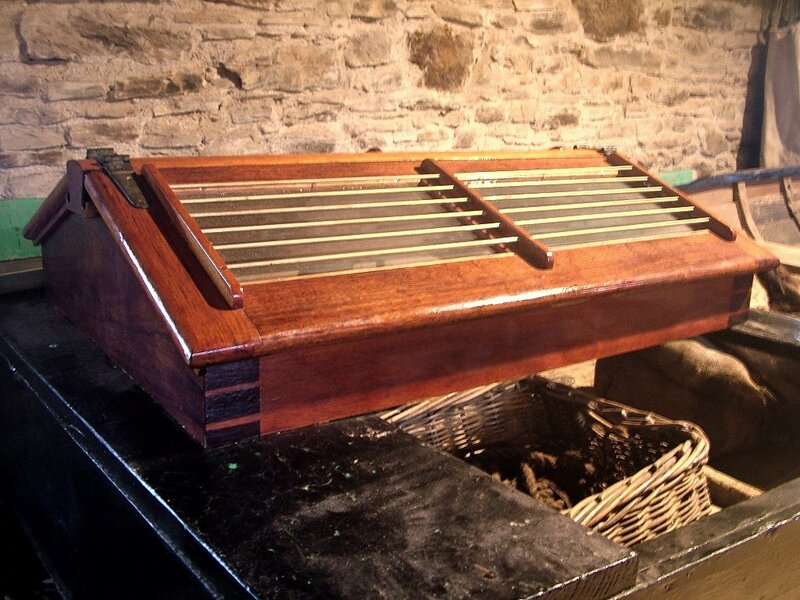 ‘We have just completed a completed rebuild from a new backbone up of a Tamar Valley Salmon Skiff. An original member left in the boat has the rope marks where the net led over the side. 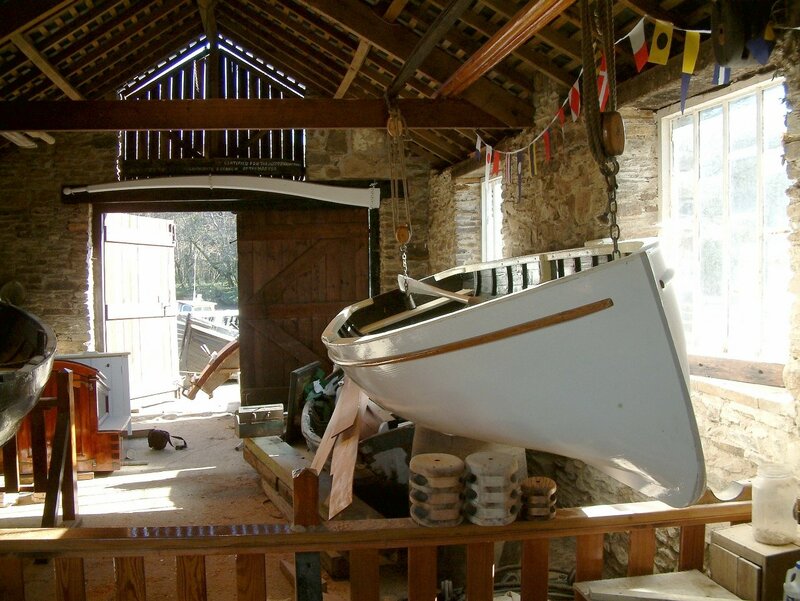 ‘We have also restored the Duke of Bedford’s boathouse for the Tamar Valley Trust and extensively repaired a neglected cornish punt. ‘We have an MOD contract from the flagship of the Royal Navy, HMS Victory, to build a new 26ft ship’s cutter to a draught from the National Maritime Museum to an 1805 specification form D. Steele’s ‘Naval Architecture’. 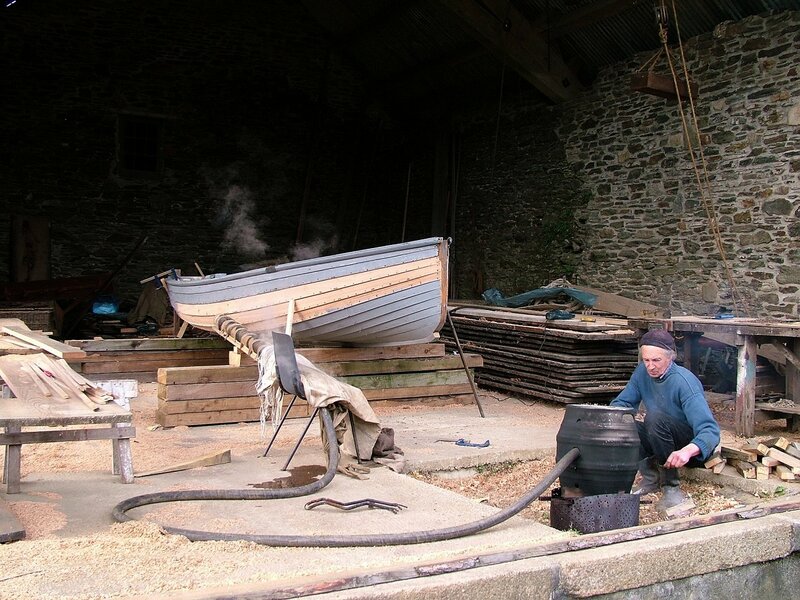 ‘Cornish Master Shipwright Ted Luck is now helping me and lending much valuable experience to the operation. I don’t know about you, dear reader, but Will’s report has left me breathless!